Spring in the Midwest is a fickle season. March started out lovely and then went back and forth between cold and rainy to lovely and well it continued into April. Gross! Once Valentine's Day has come and gone I am basically ready for spring weather, spring attire and playtime to take place outdoors daily. In hopes of inspiring the weather to remember spring had sprung, I spent last week spring cleaning. I clean the house on the regular (read weekly) but there are some tasks that don't get done on the regular. Here are 10 things to add to your cleaning routine to get your house spring ready! 1/ Refrigerator and Freezer: I emptied everything out, tossed anything that needed to be and wiped our all drawers, shelves, dispensers, etc before placing the items back in. I did this before a grocery store run so my fridge was pretty bare which made the task simple. I didn't think our fridge was dirty but it certainly was more organized and my husband noticed!!! Cue the face of shock! 2/ Behind oven, fridge and top of cabinets: These spaces just collect dust and because we don't see them often ever they tend to get neglected. It was a simple extra step that didn't require much time or effort but the "cleanliness next to holiness" side of me just loved sucking up those dust bunnies to be banished forever! 3/ Bedding: We went beyond the typical sheet change. We washed all the bedding; pillows, mattress pads, blankets, duvets, bed skirts. It was a LOT of washing but I just think of all the unseen dust and such that was washed away. 4/ Blinds: The most tedious, painstaking task of my spring cleaning routine. Section by section, dust them off. They do get so dusty and I noticed this week when cleaning my house did seem noticeably less dusty than usual. I'm just going to attribute that to being a HUGE help! 5/ Windows and windowsills: We have our windows open a LOT during the fall and then with winter and all that moisture, the windowsills can get quite dirty. I will need to take the screens out and hose them off but that will be another weekend now that the weather has warmed up. 6/ Diffusers: We use our YL diffusers every night and I don't always clean them as often as I should. I just learned that the oils can actually build up in our diffusers over time and cause them not to work! YIKES! So I let distilled vinegar sit in them about 8 hours (put some in when you wake up), ran it with the vinegar in it for 3-5 minutes then, emptied it, used water to clean the tight spaces and rubbing alcohol on the metal disc. Super simple! 7/ Purge everything: I went through all cabinets, drawers, and closets in every room (including kitchen and bathroom, hall closets, entryway closet). I switched out clothes for a new season, got rid of tones to donate or put in our spring garage sell. That task made our whole house feel more put together. 8/ Vacuum: Walls, baseboards, corners, air vents. Vacuum EV-ER-Y-THING! Use the attachments, move the furniture, and get to work! 9/ Vacuum: No this isn't listed twice by mistake. I clean our vacuum every few months but after a spring cleaning, it needed done again. We have a shark and I empty out the canister, wash and rinse the filters and wipe out all the parts I can. We want to actually have our vacuums work well right? 10/ Light Fixtures: There are some I do pretty regularly but others I just overlook. I did them all when I cleaned. Bathrooms, hallways, entryway, bedrooms! ALL OF THEM! It wasn't too hard but it did make me want to update/replace some of them! Ha! 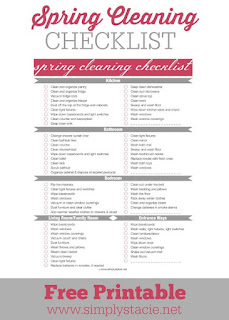 Here is a spring cleaning checklist I used. I broke my house into phases and it took about 3.5 days. Do you spring clean? What would you add? After all of these years, it still surprises me when I try to make a plan but then feel a tug to go a different direction. I'm a planner to my core. I like organization. I like to know the details. I like consistency and order. I thrive on checklists, tidiness, and a well thought out plan. I like to let loose and have fun, but I also want to know what's coming next. I have a tendency to make plans for my life. I always have. I knew what I wanted to go to college and study. I knew I wanted to be married young and have a family right away. I knew I wanted two boys and two girls. I knew I wanted to have the perfect house, in the perfect neighborhood (preferably in the south) and to spend my days teaching and my summers taking my little family to the pool. Yet, there has been a lot I haven't planned on. I didn't plan on the first year of marriage being so trying. I didn't plan how hard it was to learn to live with someone and put them first and to truly be the kind of wife Christ calls us to be. I didn't plan on having a c-section with our first (with all) child. I didn't plan that after having our first son, I would struggle with feeling down. I didn't plan to quit my job at the time I did and I never planned on moving to a small town I had only heard of once before. All of those "unplanned" parts of my life God used. In every season of difficulty was growth. My faith was deepened because I leaned in to God and his constant, unwavering love. He pulled me in and spoke truths to my heart. I think for me, those seasons of growth were necessary. They were necessary because, without them, I wouldn't be aware of God's voice. I wouldn't be seeking so deeply His plan for my life. He has proven over and over that His plans are so much better. This last year has revealed new plans for my life. Plans I never expected. I don't know when or how, but God has gently tugged and whispered to my heart, creating a desire so deep that it moves me to tears when I think about it. I'm still a planner. I still thrive on details and organization and consistency. I still love to know what's coming. But I'm learning to release the details to the One who has orchestrated them all so much better than any plan I've ever come up with. First Monday of a new month! How is it April already??? This year is going entirely too fast and although I don't want to wish it away, I am always excited for summer and we have some really FUN things coming up this year that I am looking forward to! I like to set goals often. Goals for my personal life, my faith walk, my fitness, my business. I don't wait for a new month to set goals but I do like to look at the month ahead and reflect on what I could change or some areas of my life that seem to need some concentration. So here are my goals for this new month! Finish Insanity Max:30. I am starting the 7th week of this eight week program. I did this program over a year ago and honestly lost focus during the second month. This time I decided to embrace the sweat, difficulty and process. Cardio has never been my favorite kind of workout and I allowed my dislike for it to keep me from digging deep last time. This time I found that although cardio still isn't my favorite, I love pushing myself, feeling breathless and really concentrating on the muscles I am using. Two more weeks and I will be more than happy to send in my results and earn my free shirt! Another fitness goal?!? Seriously??! (eye roll) Being healthy is something I am really passionate about. I believe that God gave us this one body and we really are called to treat it as a temple. 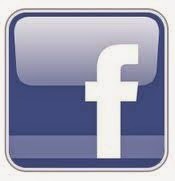 I will be starting the Ultimate Reset on the 18th. This program is a whole food eating plan that resets and repairs the body from the inside. There are no workouts (yoga and walking are encouraged). I know eating well is hard for me and so I am using this three week program to really help me focus on eating well, but also to dig deeper into my faith and seeking out where God is calling me. I've been experiencing some SERIOUS tugs on my heart these past few months and I want to seek out what God is saying, decipher what He is leading me and my family to. Giving up physical cravings and focus on quenching my spirit and craving more of Him and His word. Spring cleaning! I keep a pretty tidy house. Not just picked up. I like it clean! But there are some definite spring cleaning items we need to get to. --Cleaning out/Organizing Cabinets: Bathroom, Kitchen, Laundry room...all the cabinets!! 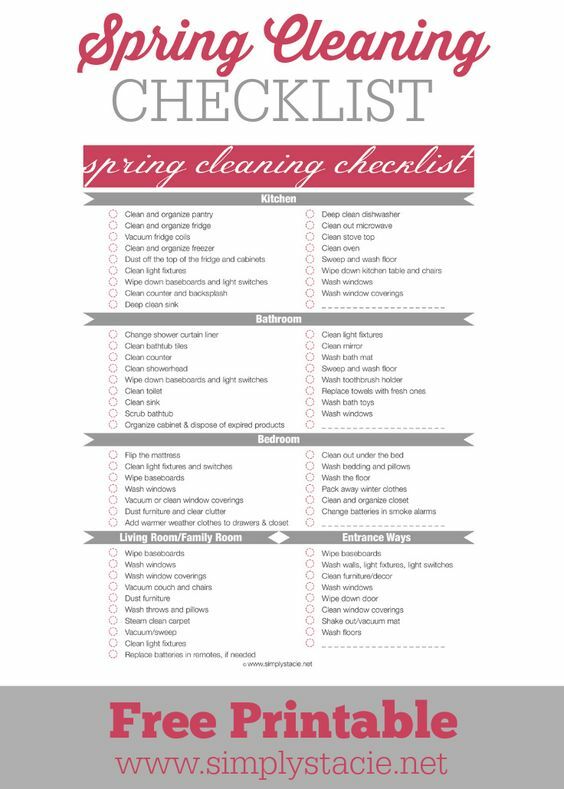 Anyone ever find a good spring cleaning list?? I swear I have probably pinned a dozen!! Should probably compile and print out the best ones! Read more. I have two books I'm in the middle of. One I need to start. And then, I'd like to find a new devotional type book and one for leisure reading. I love to read but don't always make time for it. So silly! I'm open to suggestions if you have some good books on your list! That's it for April! Those are my four focused goals! Lots to accomplish but definitely all things that will challenge me, grow me, and help me feel more organized!